There has been much debate about the use of high sensitivity troponins in the ED over the last year, but the picture is getting clearer as we see more trials looking at the utility of the assay in practice. NPV for -ve HsTrop at 0-2 hours, -ve ECG, TIMI <2: 99.7%. Ready for prime time now? Here in Virchester we have our very own high sensitivity Troponin expert, the very clever Dr Rick Body. On the other side of the world there is another very clever emergency physician with real expertise in this area and that is the super Louise Cullen. If you’re not following them on twitter – you should. Unlike some luminaries of the emergency medicine world…., Cullen and Body do understand the role and potential of high sensitivity Troponins for the early exclusion of significant myocardial disease in the emergency department. This month Cullen’s group have published a validation study of the 2-hour rule out strategy for patients presenting to the ED with pain consistent with myocardial disease. This is important work as when decision rules are created in an initial data set they always work well, we only really know if they are going to work by testing them in a different population of patients (the validation part). @DrGDH Easy done!! ADAPT ADP in practice locally where sens cTn assay used. Now for new ADP with highly sens I assay. Ready for prime time! For patients with a TIMI score of 0 (the original ADAPT ADP) sensitivity, specificity, and negative predictive value were 100% (95% CI 98.5-100%), 23.1%(20.9-25.3%), and 100% (98.8-100%). For patients with a TIMI score of 0 or 1 in the original (ADAPT) cohort (i.e. a modified version of the ADP) sensitivity, specificity, and negative predictive value for TIMI≤1in the primary cohort were 99.2 (97.1-99.8%), 48.7 (46.1-51.3%), and 99.7 (98.9-99.9%). For patients with a TIMI score of 0 or 1 in the secondary (APACE) cohort the sensitivity, specificity, and negative value were 99.4% (96.5-100%), 46.5% (42.9-50.1%), and 99.7% (98.4-100%). 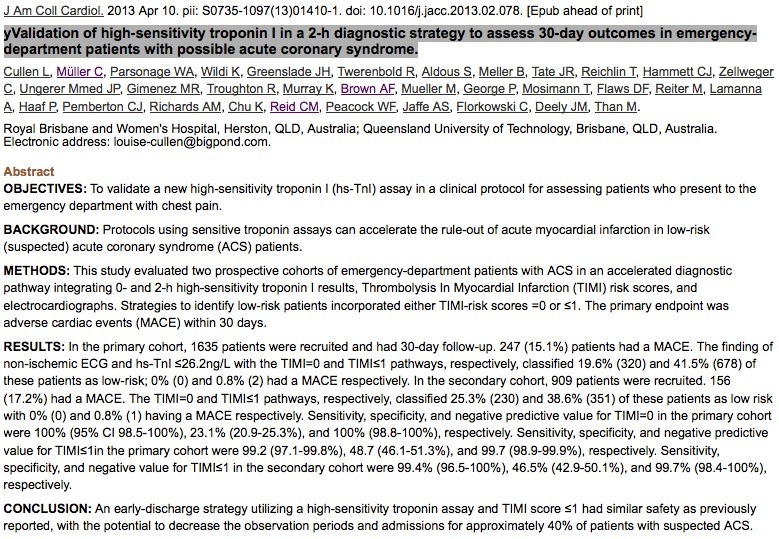 In the original ADAPT study, patients with a TIMI risk score of 0 who had normal troponin I at 0 and 2 hours (using a non-high sensitivity assay) had an extremely low rate (0.25%) of adverse events. Most people are likely to feel that this rate is acceptably low to allow early discharge. Thus, the ADP could have enabled 20% of patients to be discharged early. However, if you tried to also send home the patients with a TIMI risk score of 1, the rate of adverse events would have increased to an unacceptable level. This new study essentially investigated how things might change when a high sensitivity troponin assay is used. With this more sensitive assay, the combination of normal troponins at 0 and 2 hours, normal ECG and TIMI risk score of 0 or 1 (the modified ADP) also identified a group of patients with a very low (in this cohort, 0%) incidence of adverse events. Using this modified ADP, the proportion of patients who could be ‘ruled out’ rose to 41.5%. So, by using a high sensitivity troponin assay, more patients could potentially have an acute coronary syndrome excluded within a few hours of arriving in the ED than if you use a standard troponin assay. So how would the 2 hour rule out strategy work in practice? The key question from a pragmatic perspective is how useful the test would be in practice. What would be great is if the test can safely identify a large number of patients suitable for early discharge. Where is that bar to be set? At what proportion of patients do we decide that this is ‘useful’? Yours may be different, but for me the benchmark runs something like this…. Now, the figure that you get for this will vary with the nature of the cohort you intend to use the test in, which is why it’s so important for you to know the characteristics of your own population before using a new test. Having said that the fairly strict and well known inclusion criteria in this study will limit significant variability (a strength of using the widely known TIMI score). Helpfully in this study we can look at the cohorts and see how many of the patients would be classified as low risk, and the numbers look useful. In the datasets analysed 40% of patients could be discharged early using the 2-hour rule. [/DDET[/DDET]p>[DDET [DDET "So, is it all fantastic?”] ever? Clearly not, all papers need appraisal and this study is just the same. The authors are pretty good at highlighting the issues around patient characteristics and the protocol, and it is also worth revisiting the editorial associated with the original studies by Erik Hess. In particular there is the issue of cointervention where patients with negative tests had coronary interventions following ED attendance. These are tricky patients in the study to deal with. However, this is probably as good as we can get thus far and it looks like high sensitivity troponins are indeed ready for prime time. So what are you guys doing in Virchester?